The Electricity at Work Regulations 1989 (sometimes called “Electricity at Work Act”) , are statutory regulations, which require precautions to be taken against the risk of death or personal injury from electricity in work activities. The Regulations were set up under the Health and Safety at Work Act 1974, which sets out the general health and safety duties of employers, employees and the self-employed. 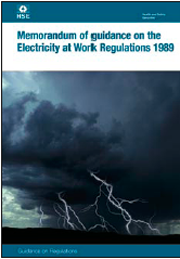 The Electricity at Work Regulations 1989 come in to force on 1 April 1990. It placed duties on employers to ensure, amongst other things, that employees engaged in such work activities on or near electrical equipment implement safe systems of work, have technical knowledge, training or experience to carry out the work safely, and are provided with suitable tools, test equipment and personal protective equipment appropriate to the work they are required to carry out. To achieve compliance with the Electricity at Work Regulations (or Electricity at Work Act), demonstrable evidence is required to prove that electrical systems and equipment are safe. 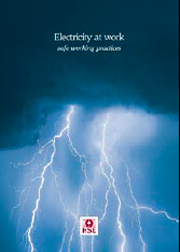 The Memorandum of Guidance on the Electricity at Work Regulations 1989 (HSR25) is a book published by the HSE, which sets out the Electricity at Work Regulations 1989 and gives guidance on them. It is intended to help dutyholders meet the requirements of the Electricity at Work Reglations 1989. It sets out the Regulations and gives technical and legal guidance on them. The book is relevant to all work activities and premises except mines and quarries, certain offshore installations and certain ships. Generic guidance on safe working practices for work on electrical equipment is published by the HSE in its guidance note entitled Electricity at Work – Safe Working Practices (HSG85). It provides guidance on the key elements that need to be considered when devising safe working practices for people who carry out work on or near electrical equipment. It includes advice that is relevant to managers and supervisors who control or influence the design, specification, selection, installation, commissioning, maintenance or operation of electrical equipment. The first edition was published in 1993.